Thanks to John Ulrich and Greg Barratt of Stainless Cycle for providing some of this information on the Yahoo! Loopframe_Guzzi news group. 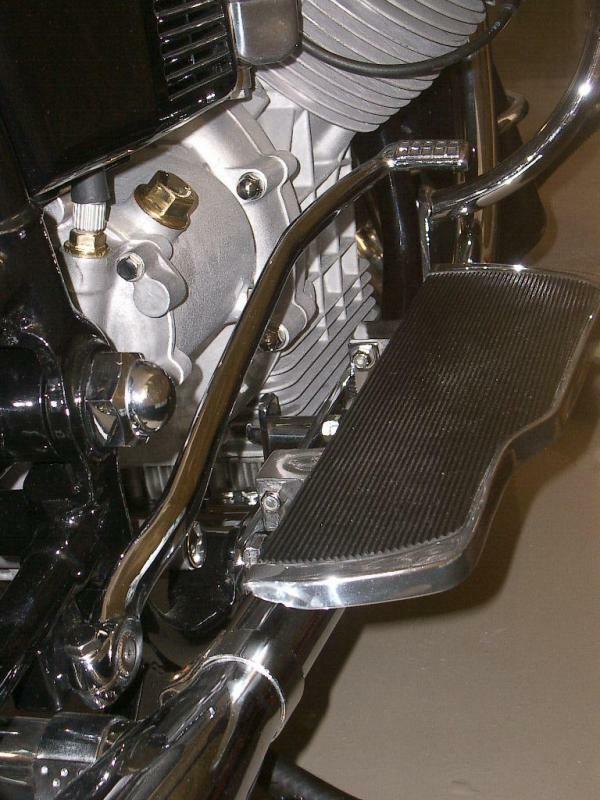 Moto Guzzi footboards - The original Moto Guzzi footboards accept a fairly generic sized rubber piece that can be sourced from any of a number of sources such as Drag Specialities part number DS254411. Triple A, Bates, and Dan Brown (DB) footboards - These footboards have unique shapes that prevent the use of readily available replacements. Instead, a generic rubber mat can be cut to fit. Stair tread rubber from a local hardware store works well. Alternatively, McMaster-Carr part number 6895T711 is a V-Rib Anti-slip rubber mat that works very well. McMaster-Carr part number 6895T711 on John Ulrich's Bates footboards. Photo courtesy of John Ulrich.